Features a bright touch screen operator interface that allows a dimension such as 25-15/16 inches to be entered by touching only 4 buttons! 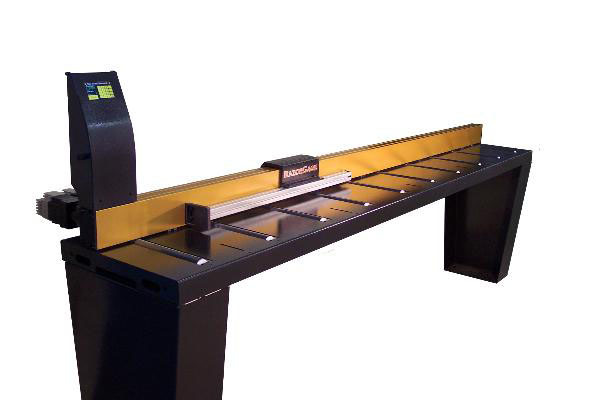 The positioner immediately moves to position. No need to look up and enter the decimal equivalent. 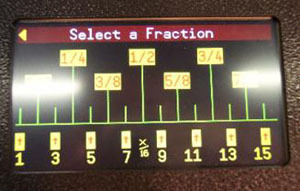 A simple graphical touch screen allows fractional entries down to 1/16th inch increments. 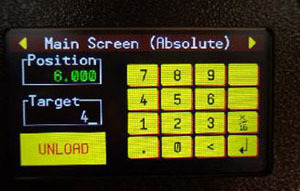 Many other screen menus are available including a simple calibration screen. This machine accommodates future upgrade to a PC with 15" touch screen should you desire downloading with the popular RazorGage AutoList software. May be mounted onto an existing table or cabinet using standard carriage bolts that fit "T" slots in the bottom of the extrusion. Tables and attach bracket (TAB) for saw. Extra leg available as an option to the TAB.